When the Council is not in some sort of disagreement with an Emperor, its members are often looking for ways to curry favor with the Ruby Throne. Each member receives an amulet worth a small fortune which is specially crafted as a symbol of their office. As a prominent family in Cyrodiil garners more and more power and repute, people eventually start thinking it's just a matter of time before they obtain a representative on the Council, though it's not clear exactly how new Council members are appointed. Appointment is seen as both an honor and burden, though some nobles view it only as a means to obtain more power and influence. While its importance cannot be overstated, much of the Elder Council's responsibilities consist of the intricate but dull problems of running an Empire, such as administering Imperial taxes on vassal kingdoms. [nb 4][nb 5] The Council is typically concerned with taxation, infrastructure, and minor legislation (of which the Emperor holds veto power). The Council only tends to get noticed when its members are dealing with some emergency or power struggle related to the Emperor. The Council is responsible for recognizing and crowning the next ruler upon the death of the Emperor, and they are tasked with running the government in the interim under the leadership of the High Chancellor, the de facto leader of the whole Empire during such periods. The Council may also recognize an Emperor or Empress Regent to function as the Empire's ruler should the rightful Emperor be incompetent (if, for example, the Emperor is a minor or mentally deranged). Choosing the rightful Emperor theoretically is only a matter of birthright, but the Council has demonstrated some discretion in judging whether an individual's genealogical claims are accurate and whether that individual holds the closest relation to the original imperial bloodline (and, inevitably, various other considerations no doubt influence these decisions). Numerous times throughout history, though, the members of the Council have recognized an Emperor not because of that person's birthright, but because that person had become Emperor-in-fact by seizing the capital, along with the Council. In the extraordinary event that the Elder Council is forced to assume a longer-term regency over the Empire (if, say, something should happen to all known heirs to the Imperial throne), the Council asserts complete control over the military forces of the Empire. This regency remains until such time as the Council recognizes an individual's claim to be Emperor. If an individual cannot be decided upon, the Elder Council Charter authorizes the Council to appoint the High Chancellor as Potentate (a sort of steward who takes on the role of Emperor in all but name). The Elder Council have been spectators at some of the most important events in history. In 2E 282, Potentate Versidue-Shaie called together the Council in a meeting which has since been called the Council of Bardmont, where he announced universal martial law, and the dissolution of all armies in the Empire other than his own. This began decades of some of the bloodiest years in the history of Tamriel. According to the disputed events in The Arcturian Heresy, it was the Council who came upon the aftermath of Tiber Septim's successful ambush of the Underking, which he then lied to them about, claiming that his Imperial Battlemage Zurin Arctus had killed his guards and tried to assassinate him. Emperor Pelagius Septim II, who inherited a debt-ridden Empire when he ascended to the throne in 3E 38, dismissed the entire Elder Council and allowed only those willing to pay great sums to resume their seats. He encouraged similar acts among his vassals, and though he returned prosperity to Tamriel, his critics cite consequences. First and foremost, wise but poor individuals were reportedly lost in the process. The inexperience this introduced may have led to some of the troubles his son Antiochus faced when he in turn became Emperor. Not only that, it may have cost Pelagius II his life, as it was rumored that a former Council member was responsible for poisoning and killing him. But the most long-term effect of selling off seats on the Council was, obviously, that it became composed of the wealthiest people in the Empire. What Pelagius II may not have anticipated is that the collective power these individuals wielded would often prove equal or greater to that of the Emperor, and vicious power struggles emerged as a result. Twenty-two years after the death of Pelagius II, the Empress Kintyra II was captured at the beginning of the War of the Red Diamond in 3E 121, and the Council was outwitted by the forces of the Wolf Queen Potema and her son, Uriel Mantiarco. Their attacks made the Council send the army off to western High Rock and eastern Morrowind, leaving Cyrodiil itself weak. After a siege of the Imperial City which lasted only a fortnight, the Council recognized Potema's son as Emperor Uriel Septim III. In 3E 127, after Uriel III was captured and killed, they then recognized the next contender who laid claim to the Imperial City, Uriel III's uncle Cephorus. However, the emperors following the War of the Red Diamond yielded to the authority of the Council in order to keep some semblance of order in the land. The throne passed to Cephorus' brother Magnus, who then died in 3E 145, and the Elder Council went on to suffer through the reign of Emperor Pelagius Septim III, also known as "Pelagius the Mad". It is said Pelagius III never really ruled Tamriel, and it was the Council, along with the Emperor's wife Katariah, who made all the decisions. In 3E 147, Pelagius III reportedly declared himself incompetent to reign, and the Emperor of Tamriel entered a private asylum. The Council made Katariah the Empress Regent of Tamriel, and after Pelagius III's death in 3E 153, she was formally recognized as Empress. The disputes between Empress Katariah and the Elder Council are the stuff of legend. As a Dunmer woman with no blood claim to the throne, she was vulnerable to all sorts of prejudices and suspicions, and some even considered her ascendancy to the throne to be the beginning of the end of the Septim Dynasty. One of her disagreements with members of the Council famously resulted in a duel which her champion won. This victory, recounted in The Armorer's Challenge, earned the Empress some respect in the Council. Emperor Uriel Septim VI was crowned in 3E 290, but he was still a boy at the time. Though his mother was given a restricted Regency of the Empire, the Elder Council retained the real power, and its members enjoyed unrestricted, unlimited freedom to promulgate laws and profit from said laws. Uriel VI found it very difficult to retake the authority of the Emperor. He was given greater responsibility over the course of several years, but wasn't allowed full license to rule until he was already twenty-two years old, and by that time, the Council had stripped the office of the Emperor of almost all its real power, save the Emperor's right to veto. After six years of vetoing, bullying, and generally strong-arming the Council, Uriel VI could finally claim to truly rule Tamriel, and a sage soon coined the saying "Uriel V conquered Esroniet, but Uriel VI conquered the Elder Council". When Uriel VI died, he left behind a strong Imperial throne for his sister Morihatha. It's known that the Council frequently became frustrated with the slow pace of Morihatha's military campaigns despite their remarkable success, and it's commonly believed that a summarily tried and executed Councilman was the person who hired assassins to kill her in 3E 339. The succeeding Emperors of the Third Era maintained the dominance Uriel VI had established over the Council. However, around the onset of the Oblivion Crisis in 3E 433, it was rumored that power had shifted back to the Council under High Chancellor Ocato of Firsthold fifteen years beforehand, during the rule of Emperor Uriel Septim VII. The Crisis began with the assassination of Uriel VII and his heirs, and it would not end until the Council found a new Emperor to light the Dragonfires. Ocato ultimately recognized Martin Septim's claim to the throne on the Council's behalf, but there was no opportunity to formally crown him before he perished at the Temple of the One. Following the Oblivion Crisis, the Elder Council could not find a suitable heir to the throne, and so High Chancellor Ocato reluctantly agreed to become Potentate. His assassination in 4E 10 led to the Stormcrown Interregnum. The Elder Council fractured, leading to years of ruthless in-fighting, plots and backstabbing. Many tried to claim the Ruby Throne. Violent, unnatural storms reportedly lashed the Imperial City several times during this anarchy, always with the eye of the storm looking directly down upon White Gold Tower. This chaos did not end until the Colovian ruler Titus Mede captured the Imperial City and seized the crown in 4E 17. Corax - A Council member whose thoughts on the Dragon Break were recorded in Where Were You When the Dragon Broke?. Abnur Tharn - High Chancellor of the Elder Council circa 2E 582, one of the Five Companions. Abor - A member of the Elder Council circa 2E 582, and present at a council meeting on the day of the beginning of the Planemeld. Faleria - A member of the Elder Council circa 2E 582, and present at a council meeting on the day of the beginning of the Planemeld. Itinia - A member of the Elder Council circa 2E 582, who took shelter in the Imperial Sewers after the city was invaded during the Planemeld. Jirich - A member of the Elder Council circa 2E 582, and present at a council meeting on the day of the beginning of the Planemeld. Lovidicus - Chief Councilor of the Elder Council circa 2E 582, and present at a council meeting on the day of the beginning of the Planemeld. Pheomus Lucasta - A Council member circa 2E 578. His daughter Honoria was promised to Flaccus Terentius, Envoy-Scholar to Empress Regent Clivia Tharn, once Flaccus completed the task of revising The Emperor's Guide to Tamriel. Vandacia - A member of the Elder Council circa 2E 582. He was absent from a council meeting on the day of the beginning of the Planemeld, having decided to stay in Gideon to more effectively manage an ongoing iron crisis in the Nibenay Basin. Eternal Champion - A mysterious hero who was credited with killing the imposter Jagar Tharn and saving the true emperor, Uriel Septim VII, from Oblivion in 3E 399, thus ending the Imperial Simulacrum. Ocato of Firsthold - High Chancellor at the end of the Third Era, and Potentate in the early Fourth Era. Thane Minglumire - The Duke of Vengheto, he served on the Council before and during the reign of Empress Katariah. Thoricles Romus - An Argonian Council member, Romus is believed to have been responsible for the assassination of Empress Morihatha. He was tried and executed for the deed under the rule of Morihatha's successor, Pelagius IV. ^ Rising Threat notes that High Chancellor Ocato convened the "full" Elder Council following the Oblivion Crisis, suggesting that the Council may sometimes convene and act as a quorum. 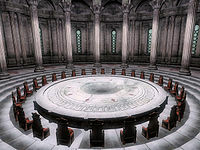 ^ It is never stated precisely how many members compose the Elder Council, though the Elder Council Chambers as seen in TES IV: Oblivion seated thirty. ^ How Orsinium Passed to the Orcs suggests the Council might have some judicial authority, as well (or at least, may give their advice on how to interpret laws to judicial officers within the Empire). ^ The Council collected direct taxes from Nova Orsinium and treated its leader as a recognized king, even though officially, the Orc homeland remained a county of High Rock, not a recognized kingdom. ^ The Council chartered and funded the Black Horse Courier, a newsletter distributed for free to the citizens of Cyrodiil during the late Third Era. ^ The "Royal Imperial Mananauts" of the Elder Council are little-known relics of ancient attempts to form expeditions to Aetherius. ^ In 3E 246, during the reign of Uriel IV, the Council decreed that any man without a liege who occupied a castle for more than three months would be granted the rights and titles of that estate. This was meant to discourage absent and foreign land ownership, as there were some tricky property rights dilemmas in Skyrim at the time. ^ Amaund Motierre's status as a Council member is inferred from the fact that he possessed an Elder Council amulet in TES V: Skyrim.